NNMI institutes include America Makes—the National Additive Manufacturing Innovation Institute, and the Lightweight Innovations for Tomorrow. Along with the annual report, Secretary Pritzker also submitted to Congress a strategic plan that describes the program’s goals for the next 3 yr. Here’s more. for the CAD/CAM Experience for Die Design & Development? We’re looking forward to seeing you at the 2016 The CAD/CAM Experience for Die Design and Development taking place on June 1-2 in Grand Rapids, MI! This popular program, presented by MetalForming magazine, will feature interactive discussions, presentations from subject matter experts and demonstrations from key companies on what’s new and trending in die-design, simulation and development software. You won’t want to miss this opportunity to learn about these new technology developments and how it can optimize your company’s manufacturing performance. Visit the event website to learn more. “Concerns about recession in the United States are far overblown,” says an economist with PNC Financial, Pittsburgh, PA. The economists quoted were interviewed by Reuters in response to recent reports on the state of the automotive industry (which still indicates strong consumer spending), and on a healthy uptick in construction spending. “The worst of the manufacturing downturn is probably over,” says this article in the NY Times. Here’s a new 2-min. video showcasing the recent application of Baxter robots (from Rethink Robotics) at CNC machine shop Standby Screw Machine Products Co., Berea (Cleveland), OH. 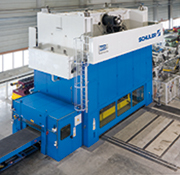 With a rich history that began by manufacturing bomb tips during WWII, the firm has installed two of the robots—one in a packaging application, the other tending a milling machine. As explained by COO and owner Bill Marcell, the robots have enabled the company to reduce labor content by as much as 50 percent, so it could reassign workers to other jobs less able to be automated. 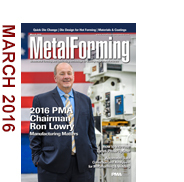 ...and 2016 PMA Chairman-elect Ron Lowry is pledging to take matters (as they relate to the health of U.S. manufacturing) into his own hands. He vows, in this election year, to honor his New Year's resolution to "complain less and do more," and urges all metalforming-company executives to join him. Asset-utilization software is the kingpin in a metalformer's campaign to enable plant-floor process ownership and responsibility, and drive down inefficiencies. And, management and staff are monitoring, as a waterfall alert system keeps uptime and OEE top-of-mind. CNC Machinist/Precision Part Manufacturing Intrapreneur (Alberta, Canada) / Nanalysis Corp.